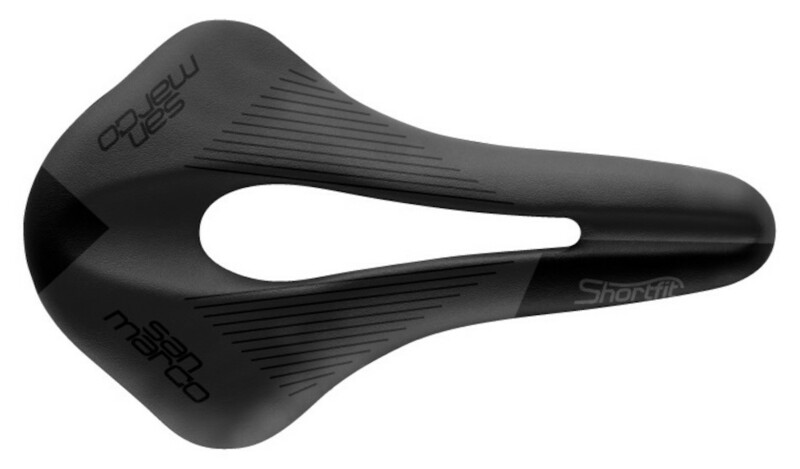 Innovation comes thick and fast from San Marco and the new Shortfit Racing Saddle is aperfect example of this. With a large pressure relieving cut-out, ample padding and a shorter body to let you find that perfect position every time you ride. The SHORTFIT saddle was created to meet the needs of the most demanding cyclists especially those who rotate forward at the pelvis when putting down maximum watts. The long central cutout (Open -Fit) guarantees all-day comfort and support on the whole length of the saddle. This feature improves the blood ow preventing numbness and provides relief from pressure on the perineum. Recommended for individuals with averagely high pelvic rotation and for women bikers. Shortfit features the side profile of the seating surface with a central depression of more than 5 mm that is similar to a curved line. For this reason, it is listed as Waved saddle. Recommended for individuals with both at back (retroverted pelvis) and accentuated lumbar arch (anteverted pelvis). The Selle Italia Turbo is a classic saddle shape from the 80's, it heralded a new age in performance saddle design and comfort and became an instant classic.